As far as towbars are concerned, in Poland there are a few excellent towbar manufacturers who succeed in sales on foreign market. The high quality of Polish towbars is proved by European homologation gained on the basis of 55 EKG ONZ (ECE) regulations or UE 94/20 (EC) regulations. Polish towbars gained popularity among thousands of drivers, car mechanics, authorized services and many customers from abroad. Martec company offers towbars produced by all Polish and foreign manufacturers. Due to lifelong cooperation with those producers we have very good relationships and we are able to provide our customers with professional help. Westfalia is a German manufacturer of premium quality towbars. Westfalia claims to have invented the idea of towbar and they have been working on their discovery for almost 100 years. Appropriately chosen Westfalia towbar always fits a given car. What is important is the fact that installation process of Westfalia towbar is very fast and efficient. Westfalia products are of highest quality made with German precision and diligence. Westfalia cooperates directly with many car manufacturers and great majority of Westfalia towbars and electric kits is installed in brand new cars. Here you may find the official website of Westfalia. Autohak is the biggest and the greatest Polish towbar manufacturer. This company puts a lot of emphasis on quality of their products. Autohak offer includes a wide range of products such as towbars, towballs, electric kits, steps for delivery vans and other accessories. Autohak is the only Polish towbar manufacturer who possesses homologation for all products. Autohak offer embraces as many as 1000 different towbars for cars and delivery vans. 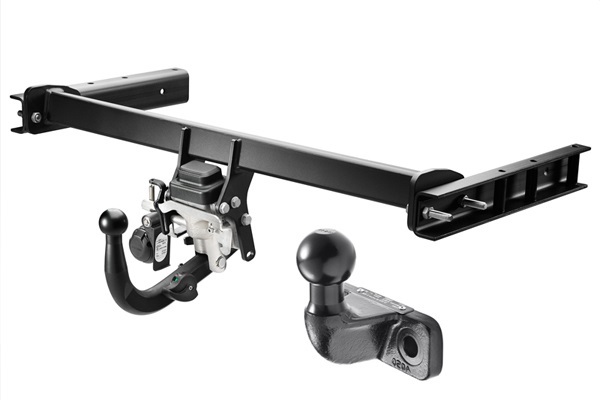 Almost every model of towbar appears in fixed version (swan neck) and detached version. Additioanlly, Autohak has two types of detached towballs: cheaper, horizontally detached system and more expensive but very convenient at the same time – vertically detached ACS system. Any choice you make will be the best choice, as Autohak products are on the top shelf. Here you may find the official website of Autohak. Steinhof is another Polish towbar manufacturer. Their headquarters are in the same town as ours – in Tarnów. As we are in the same place, we maintain friendly relationship and our cooperation is very good. That is why we are the best Steinhof towbars distributor in Poland. Steinhof towbars are famous for precision and high quality. They are covered with a special paint designed specifically for the automotive market. Similarly to Autohak, Steinhof offers fixed towbars (swan neck) , horizontally detached ACS (W6) and vertically detached (W5) towbars. W5 system is particularly attractive because the towball may be completely detached from the beam and the socket may be hidden behind the bumper, so there is no damage of the car. Brink is a huge company with the headquarters in Netherlands. They offer over 2000 models of towbars and specific electric kits. Every year their offer is extended for about 200 new items. The process of Brink towbar production is very flexible and highly automated. Brink company cooperates with almost every car manufacturer so they have the possibility to produce a towbar for every single new car model that appears on the market. They put a lot of emphasis on quality, that is why their products give you a warranty of durability, persistence, safety and reliability. Starc is a make created by Westfalia. The aim of creating Starc branch was to reach out to those customers who expect high quality and low price at the same time. Starc offer is not that wide yet but it is continuously extended. At the moment it covers several dozen of towbars for most popular cars. Starc also offers electric kits with module, which are a great alternative for more expensive, specific electric kits. Here you may find the official website of Starc. Martec is an official partner of Belgian towball manufacturer ILS (International Lashing Systems) and we supply their products to automotive wholesalers and towbar manufacturers. The most popular kind of towball is a flange towball. This is a towball with 2 montage slots (‘long reach’ type). The distance between bolts is M16 x 90mm , it can load as much as 3500kg and it can take S=350 kg of vertical pressure. So if you deal in towbars, trailers, carriages or you have an automotive shop, feel free to write to us and ask us about our special offer for wholesalers.